We have a thing with burger nights at our place- we love 'em. 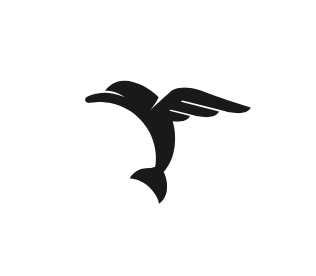 Usually, it will be one of those situations of... "What do you want to do for dinner tonight? " "I don't know, what do you want?" "Burger night?" "Sounds perfect." I have the menu down to a science, and it's all super easy but does require a bit of lengthy prep with all the washing, chopping and mixing of ingredients. 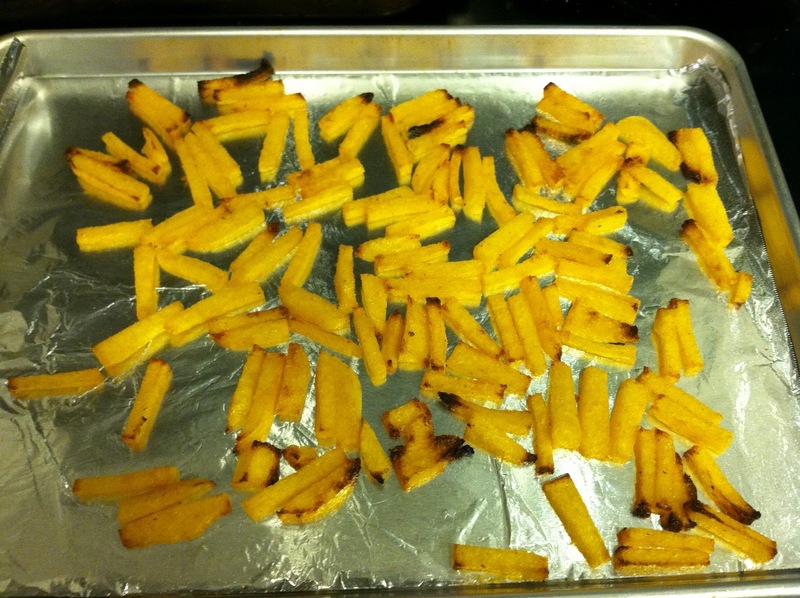 What really stands out about our burger night (besides the meat) are the "french fries" I make. 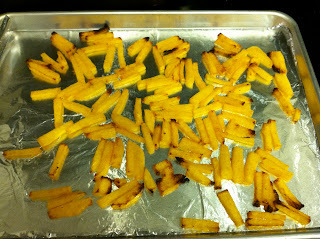 As you can guess, I'm not really a traditional french fry kinda gal, but french fries with a healthy spin? I'm in! I'll cover the rest of our burger night ingredients in another post eventually, but for now, let's talk about the fries. 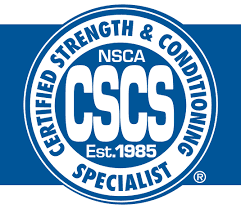 Now don't be a hater -- I get that these may not be the most nutrient-dense things in the world, nor are they any kind of super food, but we all need a little something something that just satisfies those cravings for a salty and semi-crunchy food, right? 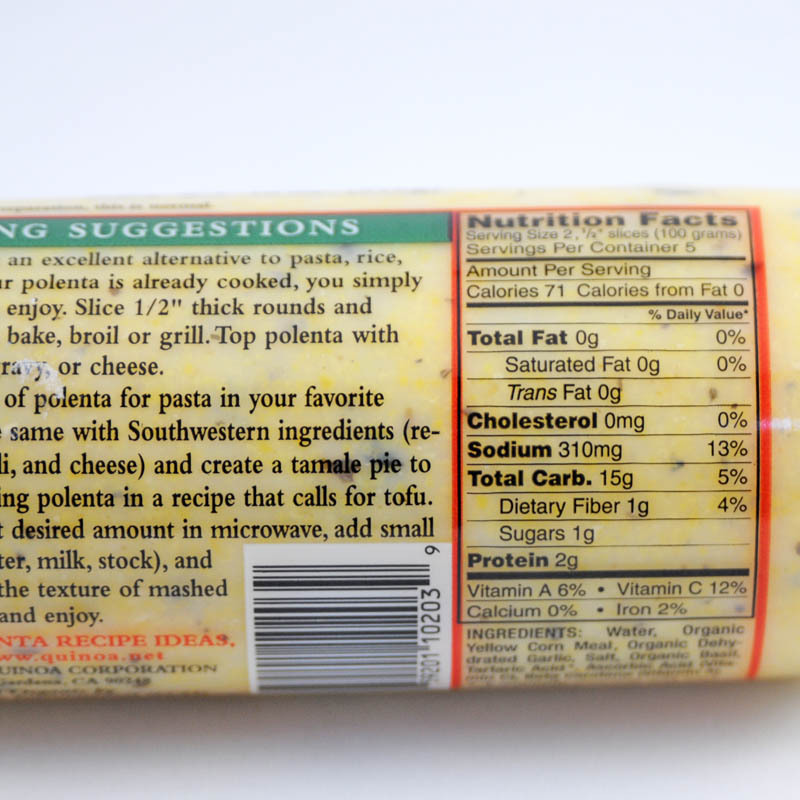 Start with your pre-cooked polenta tube. 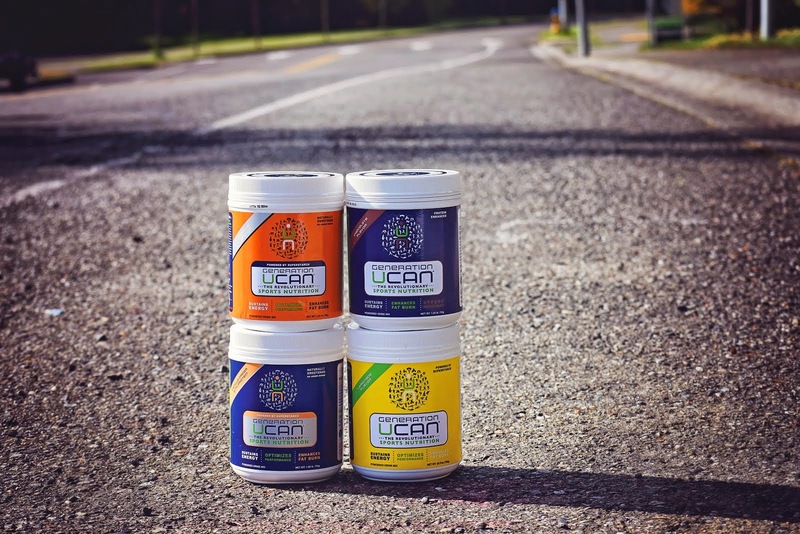 I get the kind that's pictured below; note: it is organic. The one you see there is the "original" kind that you can get at Trader Joe's, Whole Foods, etc. I normally don't get original; I usually get basil garlic or one of their other flavors for a reason. I prefer basil garlic or other varieties of this brand because they have a slightly more solid consistency and are easier to cut into fries. 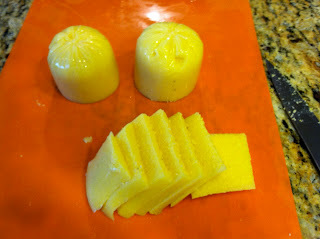 The original is more delicate and falls apart if you're not careful when cutting. So here we go: Get a sharp knife, and a damp paper towel or dish towel. 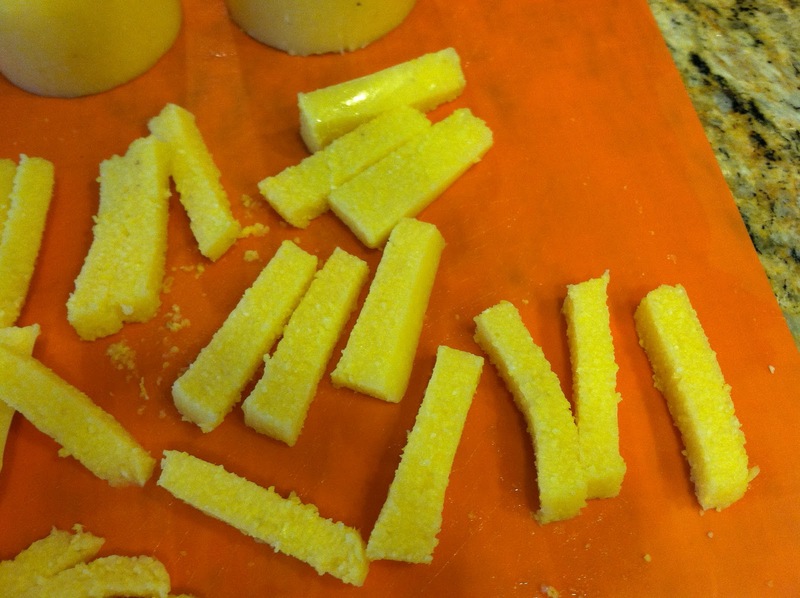 Cut the polenta into thirds. I do this with the wrapper still on, and then I just peel it off. First step: cut into thirds. Next, sit those chunks upright and cut into long slices. This is key to prevent breakage: After every 1-3 chops, wipe off your knife with the wet cloth. 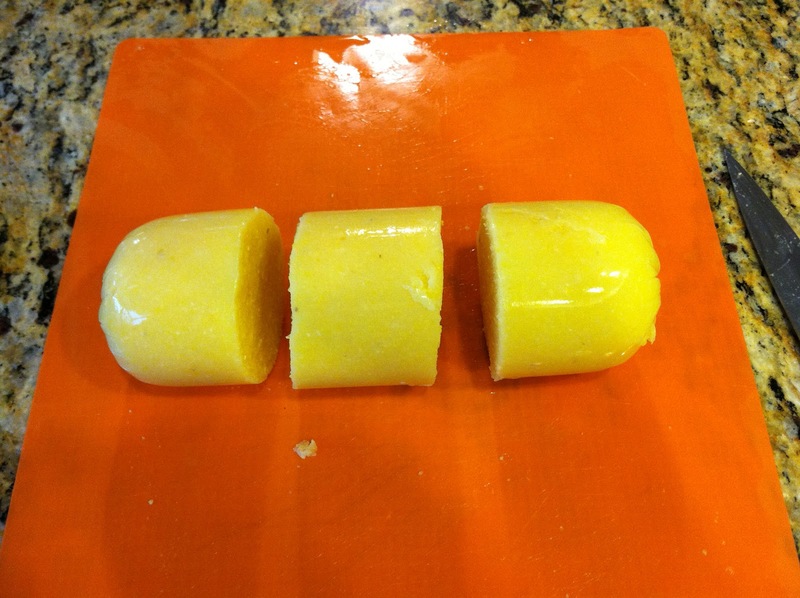 The build-up of polenta residue on the knife will cause your slices to crumble apart when cutting. Clean knife = clean cut. After you've sliced lengthwise, then turn the polenta and slice the opposite way so you get nice little cuts the size of french fries. Note how you can see some polenta crumbling off on the cutting board below? Sometimes I'll lay the flat slices out and chop up one at a time instead of all together, which seems to keep them stable. After that, line a cookie sheet with foil and spray with olive oil spray -- don't overdo it on olive oil otherwise they'll be too mushy; but you need enough to prevent sticking. 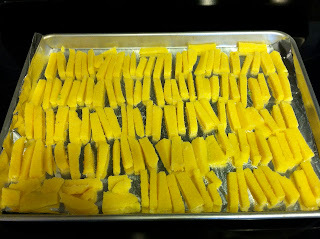 Then add all your fries to the cookie sheet and lightly spray again with olive oil. 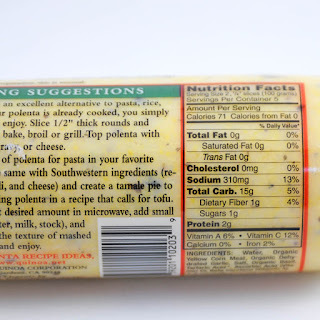 Pictured below is 1 1/4 tubes of polenta. For two people, I recommend one tube; anymore than two people get at least two tubes because the fries shrink. 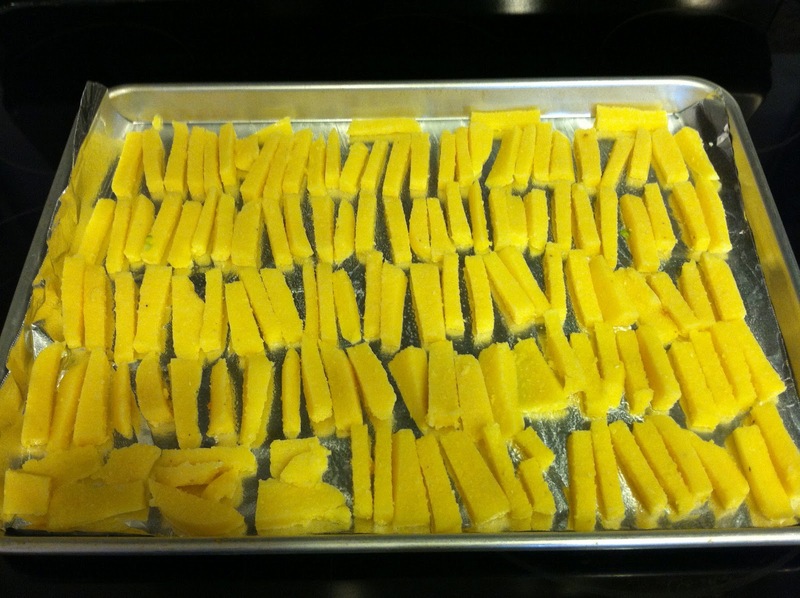 1 1/4 tubes of polenta ready to go in the oven. Bake in oven at 400 degrees for 30-40 minutes until they feel a bit crunchy on the outside and still soft in the middle. 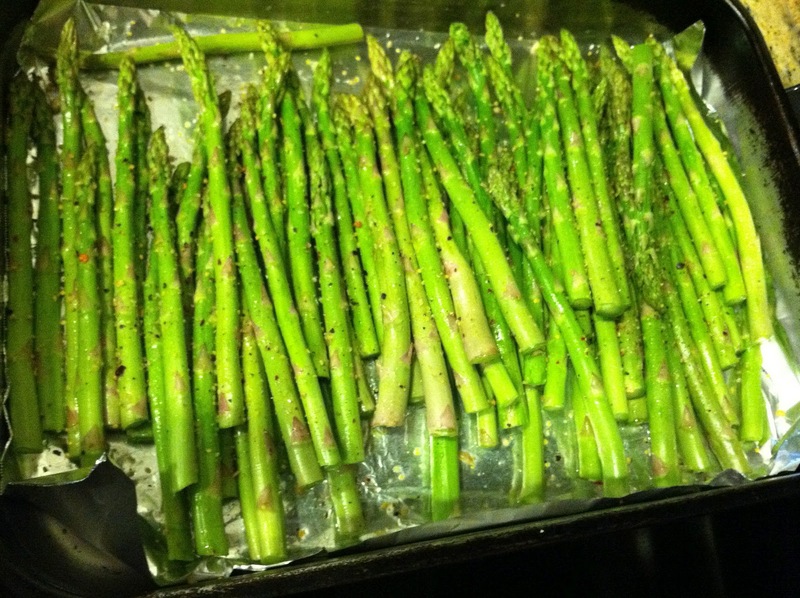 Then crank up oven to broil (high) and cook for another 5-7 minutes, or until they are browned and even more crispy. Don't broil for too long -- they'll burn! As you can see below, they do shrink quite a bit in the cooking process. When they're done they should be pretty crispy on the outside and only slightly soft in the middle. If they still feel mushy to the touch, cook longer. You want that crispy outer layer. 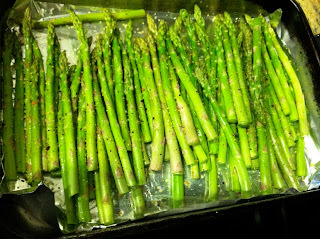 Oven-roasted asparagus. 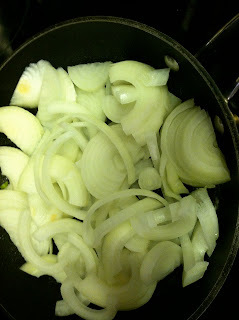 Add olive oil, lemon, s&p. eventually sliced pears are added to mix. 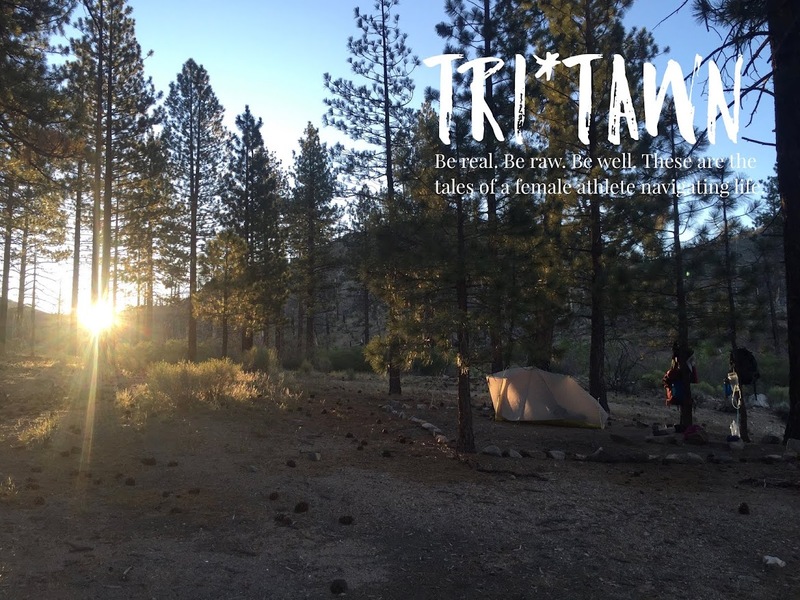 Organic, grass-fed beef. The only kind I'll get. YUM! I love polenta. I make my own and then fry it up for breakfast with a little maple syrup! I'm going to try it as fries too! I'm definitely missing out. 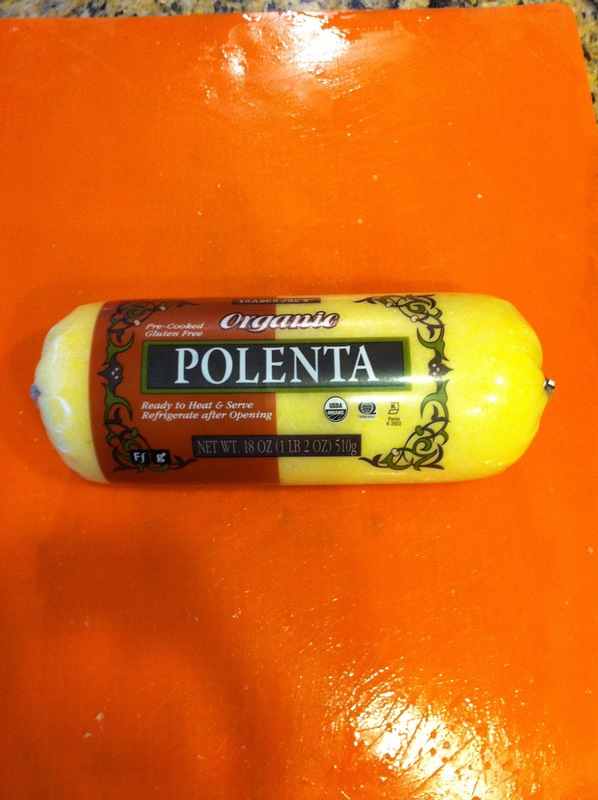 I never heard of polenta until now. Can't wait to share the experience with my husband.